Discussion in 'Flashlights & Other Illumination Devices' started by swedishelite22, Aug 14, 2018. I don't need anything fancy as most of the torch use is finding something one of my kids dropped in/under the car/restrainre table or initial/basic troubleshooting of something mechanical at work. Flashlights are not my area of expertise and there are a ton of options so I'm hoping you all can help me out. -Updated - originally looking for a single mode, upon discussion I think 2 modes would be fine, 3 maaaaaaybe but the anything under 40 lumen isn't really useable. Really, the Microstream with more lumen/longer throw and it's perfect. The USB version is near perfect but I'm really not a fan of having to recharge the light. Look into their USB rechargeable Microstream, has 250 lumens on high and 50 on low with pretty much the same size. @Kev2488 thanks. I've looked at those and they are tempting. I don't know why but I'm just not a fan of rechargeable; maybe just lack of experience. I assume output dwindles as a sign that it needs recharging (vs simply not turning on)? Can you confirm that the battery is proprietary? In that, if I'm out and the battery does die, I can or cannot throw in a standard battery to get by until I can charge again? It's interesting to note while researching this version, the coyote is the only model that starts high then goes to low mode, while the black, blue, and red models start low, then jump to high. I have mine set up for single mode output too and it is just a little bigger than a Micro but a whole lot more light if you want it. I just ordered one of the new USB micro streams and should have it by the end of the day. $27 on amazon. I wanted a rechargeable light for edc. I hate having to change batteries all the time. I tried an Olight S1mini first, and like it very well. However, I carry my lights clipped in my back pocket and the Olight’s side switch got accidentally activated and died on me twice without my knowledge, so it’s not gona work for me. The Microstream seems like a perfect solution! I believe the battery is proprietary, but it’s micro usb rechargeable, so you can charge it anywhere. You can also charge it on a a regular schedule to avoid it dying on you. I’m sure you could get a second battery to keep on hand as well. Yep..not a fan of side switches for edc/small lights. Too much time "hunting" for the switch and accidental activation are the reasons to avoid them. I just ordered one of the new USB micro streams and should have it by the end of the day. $27 on amazon. Looks like they jumped their pricing. Last nice when I looked it as $27 and now it's $32. I'm curious when you get it to hear confirmation that the battery is a dedicated SL battery or if a standard battery can be used in a pinch. I don't believe a standard battery would supply the current needed to run the light @ 250 lumen level. It might work on the 50 lumen setting, but their documentation doesn't seem to address whether a standard battery could be substituted in a pinch. leathermaneod and swedishelite22 like this. @Tesla thanks for the clarification. I got mine this afternoon. Seems good so far, it’s currently charging. I got the boxed version, 66604. I noticed it has the more matte like finish, same as my standard microstream, as opposed to some streamlights that are slightly shinier. I also noticed that the rubber portion of the tail switch unscrews separately from the rest of the tail cap, but there is no o ring in that part, I assume it is normal though since my other microstream and protac 1 AAA are the same way. I will probably add some plumbers grease to the o ring that seals the USB port because it looks a little dry. I checked the paperwork for any info about using a standard AAA, but it doesn’t say anything. I’m sure it would if you could since that would qualify as dual fuel, I would think. However, I also checked online for a replacement battery and they are available for $5.99. The new Olight I3T EOS might be worth a look if you can live with two modes. Simple low/high operation,no strobe or memory so it shouldn't be too vexing. Priced right at $20 it looks promising for a low cost AAA. Unfortunately I don't have one and info is still pretty sparse since it is a new light. Tempted to grab one myself but my light budget is a little on the lean side right now. Thanks for the recommendation. That's a good looking light but I'm thinking 5 lumens to 180 is a big jump. I don't find the 45 of the standard micro to be too much so 5 may not be enough, especially with such a big jump in the second mode. The 5 to 180 does seem like an odd combo but the light still interests me. I suspect Olight wanted a bright light but one that could still offer long run time on a AAA if necessary. A 20-30 lumen low with a shorter run time would probably have appeal to a wider audience. The 5 to 180 does seem like an odd combo but the light still interests me. I suspect Olight wanted a bright light but one that could still offer long run time on a AAA if necessary. A 20-30 lumen low with a shorter fun time would probably have appeal to a wider audience. I agree. I think Olight missed the boat conceptually on this one. The Fenix LD02 is a much better light for about $10 more. 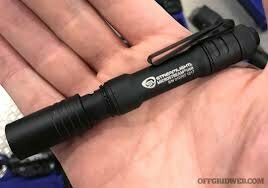 It has a middle setting (M-L-H is the sequence), and is shorter than the Olight, which is a little bit bloated for a AAA light. Also, the Lumintop tool lights are a much better choice. I warmly recommend the Thrunite T10 - It is around for a few years now and super reliable. I have mine in stainless since 3 1/2 years clipped to my right backpocket every single day, all day. -High (252 lumens /1.5 hours). Firefly/Moonlight is perfect for checking for the kids at night or when you need just a bit in absolute darkness without blinding yourself, the low/medium is the ideal allrounder mode to see what you need to see close up or inside buildings/room, illuminate a tent, walk around, find stuff you dropped and for that extra oomph when you want to fully light up a whole room or see far outside, you got high, which is really pretty surprisingly bright. They come in cool white or neutral white (warmer tint, I prefer this one) - you would think that 15 to 250 is a bit too much a gap, but actually 15 is enough for most things you do in the dark and the runtime is great. I never missed a mode inbetween. Take my word: I have a fenix E11 with 30 to 110 lumen and I think in the fenix the gap is barely noticeable and 30 is already too bright for some uses, especially inside, like reading, working in confined spaces, it just blinds you a lot. It takes eneloops or regular AA batteries, which is very convenient, the button is slightly recessed, so it won't turn on accidentally and it can tailstand, so you can just put it somewhere and light up a room and have hands free. And the best thing: it has mode memory, which I love because it is sooo useful. You can set your preferred mode to start just by turning it off in that mode. you circle through the modes either by double click or tapping the switch once on the tailswitch or by twisting the head (which I never do, always use the switch), very intuitive. It is so easy to use that my two year old son could use it. My stainless version had a screw-on clip, which is excellent, but the alu version should be just fine and has the same head. It even is brighter nowadays than the one I got over 3 years ago. Mine had only 160 or so lumens, which is still more than enough. Mine came even with a diffusor to put on the light, which is nice to have. I cannot recommend this light enough. I used it every single day since over 1200 days, even dropped it on concrete probably a dozen times (since it is stainless it still looks like new) and had absolutely zero issues with it. I have a few lights, but this is by far my favourite. I even like that my stainless version is a bit on the heavy side. There used to be a titanium version as well for about the same price as the stainless. The Aluminium version is about 20$ on the Thrunite website, so totally within your price range. For the price, it is a steal. edit: oh, I did not see you wanted only single mode, oops. but still: Thanks to the mode memory you can use it like single mode and just turn it on and off and never switch modes unless you really want to. 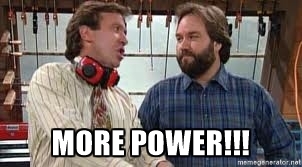 So you can besically just set it on high for more power and leave it there forever. I usually set mine on the medium mode and leave it there most of the time. This is akin to running nitrous oxide in a car not designed for it. It results in a Football League outcome...i.e. : NFL (Not for Long). I'm in disagreement about the light levels on the Thrunite lights. for me, .2 lumen is just too little and so is 13 for a middle setting. I like to see something more like 5, 25, 80-110 for light levels on a small light. I thought about the Tool but was trying to stick with a one or two level light since the OP originally specified a single level. I don't own a Lumintop tool but I know they are well regarded and it might be the best choice if the OP is willing to have 3 levels. I think I will get the Olight and see how the two levels work out. The high setting is what I believe would be used the most but the 5 lumen low might be useful in certain circumstances so I am not sure the modes are all that bad. It just depends on your needs.